Spitsbergen and NE Greenland - Glaciers are seen in both Spitsbergen and Greenalnd as well as huge icebergs in Greenland. Sailing Ship Trips in Greenland - many glaciers and icebergs are seen on these trips too. A Vulcanologist's Dream - Iceland is the land of Fire and Ice. 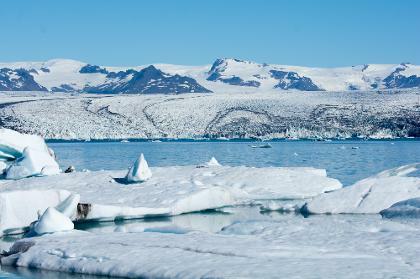 On the trip we visit several outlet glaciers of the Vatnajökull ice cap. Falkland Islands, South Georgia and Antarctica - South Georgia is a glaciated island with many glaciers to be seen.